Brian McKenzie is a fourth generation construction/kitchen designer. After graduating from the University of Florida, with a degree in Finance, Brian went on to start his own financial services company until the day his father, Kevin Mckenzie, called him with an opportunity he couldn’t refuse. Brian is a family man who is known for his outgoing personality, positive attitude and problem-solving abilities. He stays active by playing tennis, golf and beach volleyball. He enjoys spending time with his family, and spending days at the park, beach or zoo. 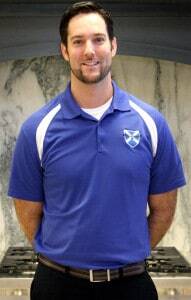 Brian is also very active in the community and coaches soccer, baseball, and volleyball at the YMCA. Brian started at McCabinet as a Cabinet Assembler in 1996, and became a full-time designer in 2004. In 2010, Brian became the sales manager, and four years later became General Manager. In 2018, he became the President of McCabinet, and now spends the majority of his time working with designers to create beautiful spaces that are both beautiful and functional. Brian has designed seven spaces that have won best kitchen or bathroom in the NARI and HBA awards.